Excellent personal analysis of competition at school - echoes my own feelings which left me ambivalent about sports even though I enjoyed (who didn't? )football and some other games but hated the pushy bit. Then, just like you, I found the hills and did a self-balancing job with my mind! Thank you for your kind appreciation on the second edition of the Ben Nevis History incidentally - as you guessed much work went into the design and I think it shows. With the interval between the 1st and 2nd editions, an entire new generation of climbers have it available for looking backwards - and forwards. Very nice article Dave. Talking of competitions though, are you doing any? 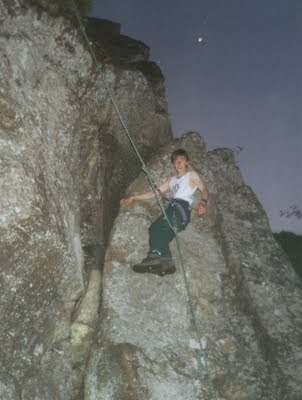 How about the Scottish Dry Tooling Series? I did the first round, really good fun! I was one of those who partook in "mainstream sports" in high school (cross country and swimming) and loved it. I played soccer for 9 years prior to that. I definitely see where you are coming from in helping kids understand competition. Here in the States, we have seen a rise in "participation trophies" and soccer games where no one keeps score. And it's the biggest load of crap I can think of. In real life, as adults, there are winners and losers. The boss doesn't care about your participation, s/he wants results. There is an entire generation of kids over here who are being raised to not understand that. Competitive sports can be great for teaching that valuable lesson. It's up to the parents to teach their kids that losing, while not necessarily fun, can be constructive. "Valuing effort, preparation, patience and critical thinking and leading by example rather than actively pushing will always work far better in the longer term." That is exactly the sentiment that this movement needs. And the emphasis on the presentation of competition in schools. And perhaps more structured competitions? Ladders instead of one-offs. I don't compete in climbing now, but I'm becoming increasingly aware of how my ability is escalating compared to the other regulars I see at the wall. If we are to see the benefits of patience, preparation and perseverence, we need a way to track progress over time. I suppose this is difficult in school, becuase everyone is improving all the time! In reply to urbanexcursion; I have to say that the games of football I play now, where no-one keeps score, are far more enjoyable than the high-pressure games I was forced to play in at school. In the UK, there is already a lot of pressure on kids to produce results when they are examined, so I don't think that they need the importance of achieving goals impressed upon them any more. If your boss wants results, then your ability to produce them is going to depend far more on your qualities as described by Dave whice I've quoted above. than competitiveness. There's a market for everything, sure, but your ability to compete in those markets depends upon your effort and preparation in that field, not just your competitiveness. It certainly has nothing to do with how good you were at football. Well written, Dave. In reply to Ken and urbanexcursion, I *hated* football at school; as a child I was useless at anything with a round ball, I was consistently picked last for most team games, and I dreaded PE lessons. Like Dave, this led me to outdoor pursuits (for want of a better term) and if the experience taught me anything, it's that sometimes it's not winning or losing that matters, it's making sure you're playing the right game in the first place. For every 10 children participating in an arbitrary PE class, I grant there are 2 or 3 who excel, who are in their element living up to the team sport ideal. But I would also argue there are another 1 or 2 who fear, if not abhor, this hour of school and who learn nothing except how to avoid or endure their classmates' and instructors' oppression. It would be wrong to assume this aversion is due to lack of athletic ability. Rather, we are not all wired to be "team players." Nor does everyone desire --or even feel comfortable in-- the group mentality that team sports demands. Educational institutions need to recognize that team sports are only one facet of athletic activity from which kids can benefit. Where are the adventure sports? The "X" sports? The individual sports like skiing, skateboarding, sailing (dinghy), even equestrian events. There is hardly a kid out there who, given the proper opportunity, won't excel at some type of athletic pursuit. Forcing every child into the same square peg of traditional phys ed is doing many a disservice and produces results that are exactly opposite the intended goal of building confidence, fitness and teamwork. A thoughtful post, Dave, and one that certainly applies to the path many of us followed on the way to becoming climbers. A couple of times recently the topic of you and toprope self belays has come up, both in the caption on the photo in this post and also in a recent post on an Australian climbing forum. It's got me wondering, what kind of toprope self belay do you use on projects like Echo Wall and The Longhope Route?